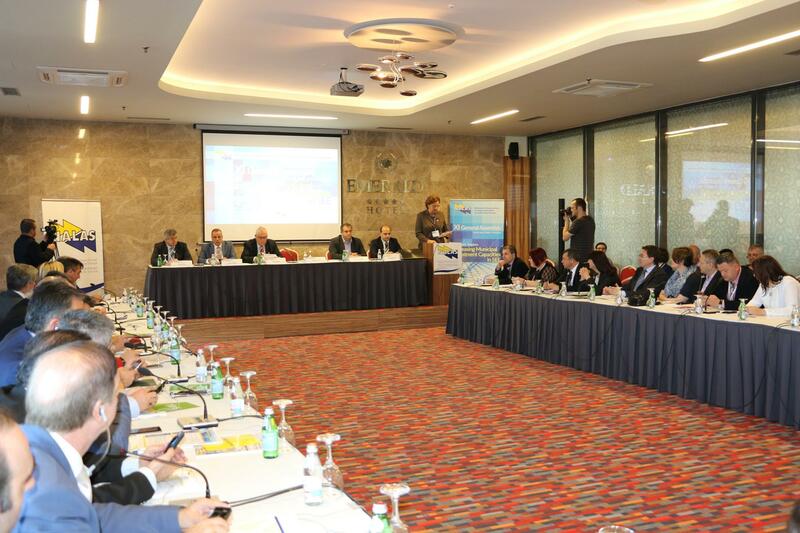 Over one hundred representatives of local governments and local government associations from the whole South-East Europe (SEE) met in Prishtina on 14 and 15 April 2016 for the XI NALAS General Assembly and a thematic session on Increasing Municipal Investment Capacities in SEE. On 14 April, the thematic session on Increasing Municipal Investment Capacities, organised in partnership with the World Bank-Austria Urban Partnership Program II, explored how capital investments at local level can support SEE municipalities to transform into sustainable communities for the benefit of their citizens. Moderated by Ms. Natasha Ilijeva-Acevska, NALAS Program Officer, the thematic session provoked vivid discussions and exchange. "Mayors have to address very complex issues in providing quality services to their citizens, while the public funds for doing so are limited due to the incomplete fiscal decentralization in the region. Grants from central government meet a small part of total needs for infrastructure and services. The international donations are useful but not enough. Local governments must be innovative and introduce new sources like pooled funding. We also need to build new kind of relationship with investors, especially the ones with the private sector", said Mayor Emil Draghici, NALAS President, in his opening speech. The thematic session focused on the role good governance of municipal finances plays in building investors' confidence. The first panel explored the challenges in capital investment projects at local level in SEE-building sustainable communities. Mr. Emil Savov, a Deputy Director of the National Association of Municipalities in the Republic of Bulgaria, a host of NALAS Fiscal Decentralisation Task Force, presented the latest NALAS Fiscal Decentralisation Indicators Report that provides a clear picture about the process of decentralisation in the whole SEE Region. The Report showed that the progress has been uneven, and there are few places where local government revenues or expenditures approach EU averages, either as percentages of GDP or of total public revenue. Municipalities are underfunded, and central governmetns are not giving them a fair share of the overall fiscal pie. "In negotiating with central governments for expanding the local revenue base, there are two key issues we must take care of: 1) Maintaining the overall fiscal stability of the country; and 2) How to further improve local governments' capacities to invest and borrow", said Mr. Savov. Using the rich experience of the Fiscal Decentralisation Task Force, NALAS Task Force on Solid Waste and Water Management for the first time prepared Benchmarking on Solid Waste Management. Mr. Miodrag Gluscevic, from the Standing Conference of Towns and Municipalities of Serbia, and a host of the Task Force, presented the key conclusions of the Report. "The report we prepared confirmed what we already knew-we produce much less waste per capita compared to the EU countries, which reduces the interest of potential investors. 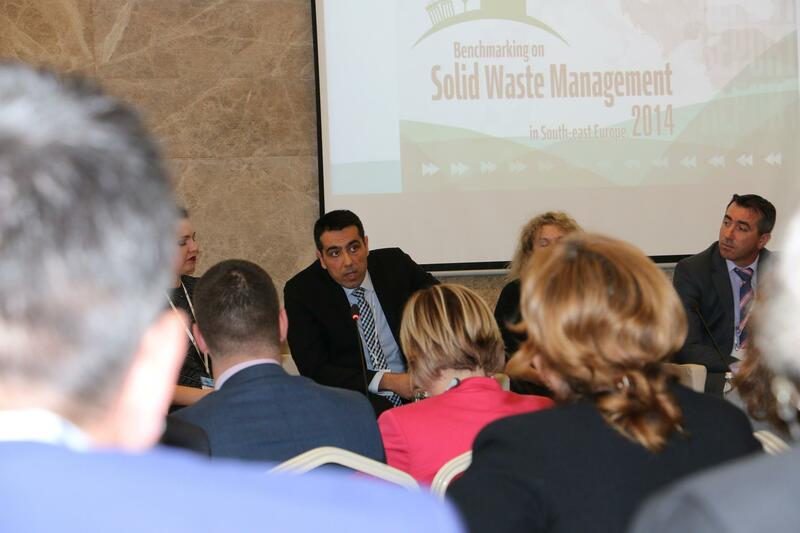 The management of solid waste in SEE is quite behind the standards of the EU. Most of the solid waste in our region is deposited, and big investments are needed to reach the circular economy that most of the EU countries have", said Mr. Gluscevic. In the panel session focused on the main challenges for municipal investments in different sectors, the hosts of the NALAS Task Forces on Urban Planning, Energy Efficiency and Sustainable Tourism shared their views on the situation with investments in the relevant sector and the role of local governments in understanding and addressing the investment challenges. "Developing sustainable tourism requires investments in developing an offer, culture, promotion, but above all investments in infrastructure", said Mr. Ivan Vukadin, Mayor of Tomislavgrad, Bosnia and Herzegovina, representing the Association of Municipalities and Cities of the Federation of Bosnia and Herzegovina, a host of NALAS Sustainable Tourism Task Force. The second panel focused on creating investors' confidence through good governance of municipal finances. Ms. Catherine Farvacque - Vitkovic from the World Bank Group presented the Municipal Finance Self-Assessment Tool and the Urban Audit Tool that help municipalities assess their work and identify improvement potentials that lead to sustainable financial solutions for investments. "We need two to tango. 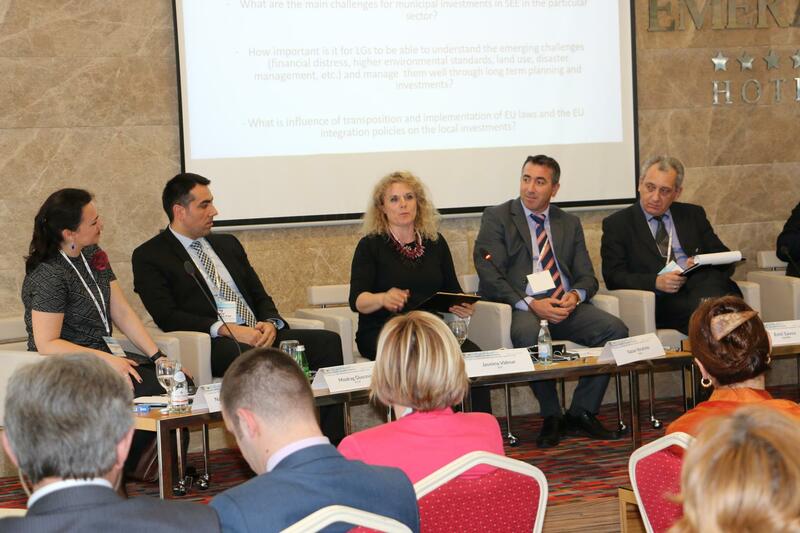 Therefore, besides supporting the municipalities in implementing the tools, we try to strengthen the dialogue between central and local government and engage in discussions on fundamental issues", said Ms. Catherine Farvacque - Vitkovic. Representatives of the City of Bijeljina, Municipality of Kisela Voda and Municipality of Gazi Baba presented their experiences with the use of the tools and the benefits they got. "By using the tools, we improved our financial planning and financial management, that lead to development of a Plan for Capital Investments 2016-2018. One of our first investment projects from this plan is regulation of river's basin that created serious trouble during the two waves of severe floods we faced", said Mr. Mico Micic, Mayor of Bijeljina and Vice-President of NALAS. "Until 2009 we had a pretty conservative attitude towards borrowing", sincerely admitted Mr. Vladimir Bozinovski from the Finance Department of the Municipality of Gazi Baba in Skopje, Macedonia. "But, the Municipal Finance Self-Assessment Tool and the action plan encouraged us to undertake steps to ensure external finances for capital investments". In the third panel, participants got the chance to listen about and learn from the practices of South-East Europe municipalities successful in attracting funding and creating infrastructure value. 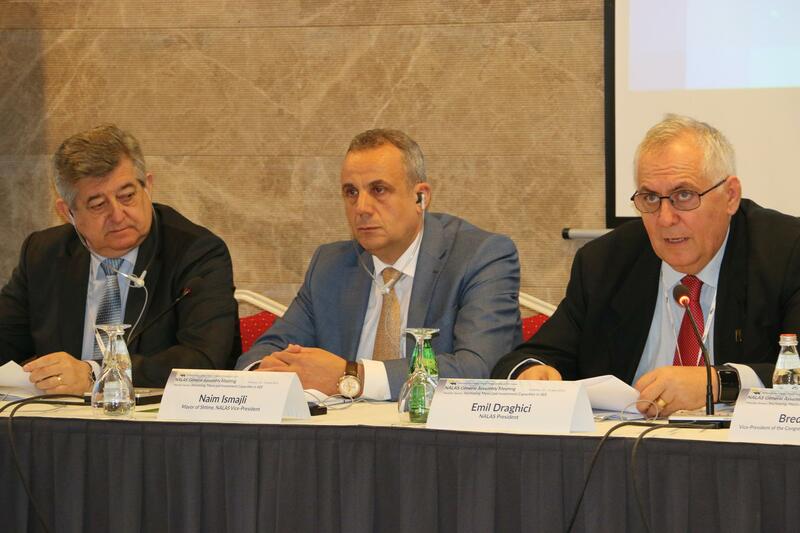 The cases of Istanbul, Rijeka, Danilovgrad and Shtime were presented. Municipality of Shtime in Kosovo is currently implemented a big project on economic zone and technological park, located at several locations, with joint funding by the Municipality, Ministry of Trade and Industry and the European Commission. "The investment, focused at fruits and vegetables processing is expected to go beyond 12 million euros and bring 600 new jobs", said Mr. Naim Ismajli, Mayor of Shtime. Mr. Mehmet Onur Partal from the Istanbul Development Agency presented the key contemporary investment projects of the Istanbul Metropolitan Municipality and the innovative solutions implemented. He explained the financing modalities used, their strengths and weaknesses, as well as the role of development agencies in boosting capital investments. Mr. Miroslav Matesic, Deputy Mayor of Rijeka, Croatia, presented Rijeka 2020 Vision, as well as the revival of Rijeka Port with foreign capital investments and improvement of local, national and European sea transport. 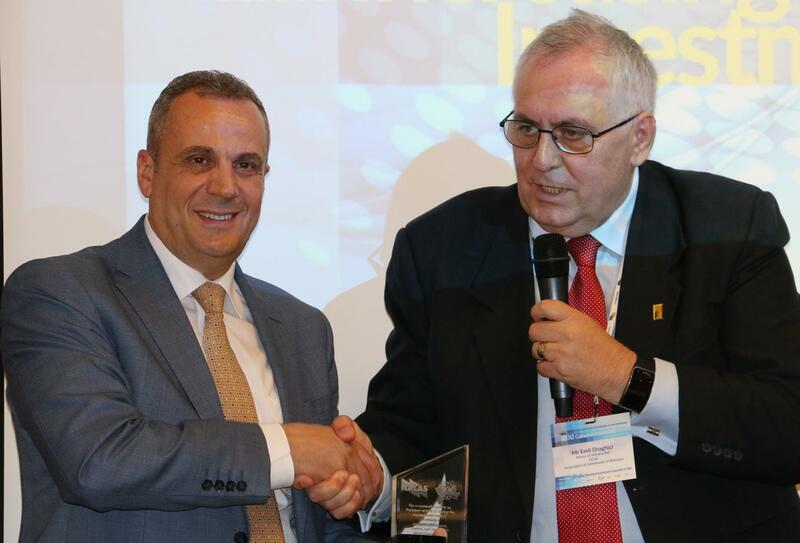 The Mayor of Danilovgrad, Montenegro, Mr. Branislav Dzuranovic presented the practices of the city acknowledged as a city of investments, because of all the measures they have implemented in the past several years. "We have reduced the communal fees for 75% and reformed our local administration, so that all processes are finished within 24 hours. As a result of our efforts, last year we had 54 million euros of investments. Our budget has been increased for 248%", proudly announced Mayor Dzuranovic. The fourth, last panel focused on current and emerging opportunities for funding municipal investments in SEE. The potentials of involving private investors for municipal services was the focus of the address of Mr. James Macbeth, GIZ Country Director for Kosovo and Macedonia. "Public-private partnerships work as marriage. Once the attraction is over, there must be a deeper meaning to keep it going", illustrated Mr. Macbeth. Ms. Voltana Ademi, Mayor of Skoder, Albania explained the national fund for stimulation of local investment in Albania, that provides competitive grants for local governments, as well as its processes, criteria and decision-making. 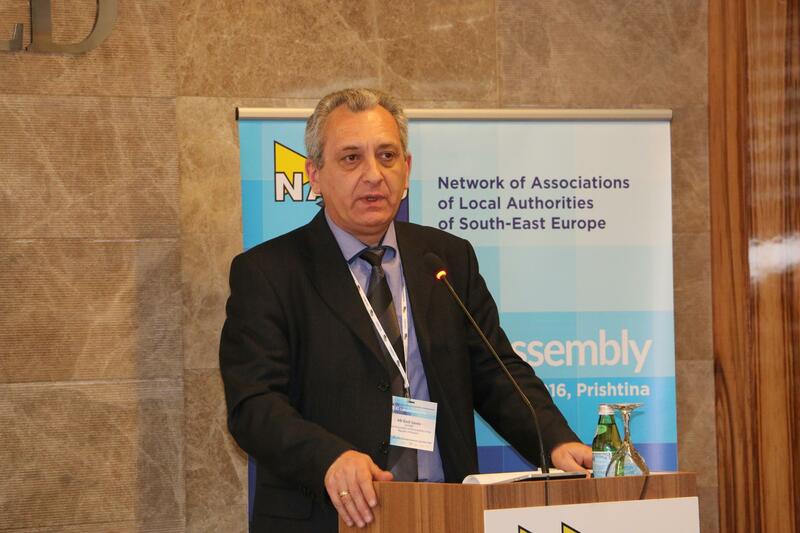 A fund for pool financing and joint borrowing operations is a new, interesting initiative in Bulgaria, presented at the thematic session by the NALAS General Assembly Delegate of the National Association of Municipalities of the Republic of Bulgaria (NAMRB), Mr. Emanuil Manolov, Mayor of Pavlikeni. The fund is part of NAMRB Strategic Plan for 2017. It will provide funding and guarantee for joint municipal investments through bond issuing, for projects that are not eligible for EU funding. The fund will ease the access to financing for investments, especially important for small municipalities. "To participate in this fund, municipalities must have a good credit rating, so that they do not compromise the fund", said Mr. Manolov. Ms. Maja Pinjo Talevska, a Senior Policy Analyst of the Regional Cooperation Council (RCC) spoke about the perspectives for regional investments for growth in SEE. "One of the key documents framing regional cooperation is the SEE2020 Strategy for growth. Municipalities have to be informed and take active participation in its implementation. 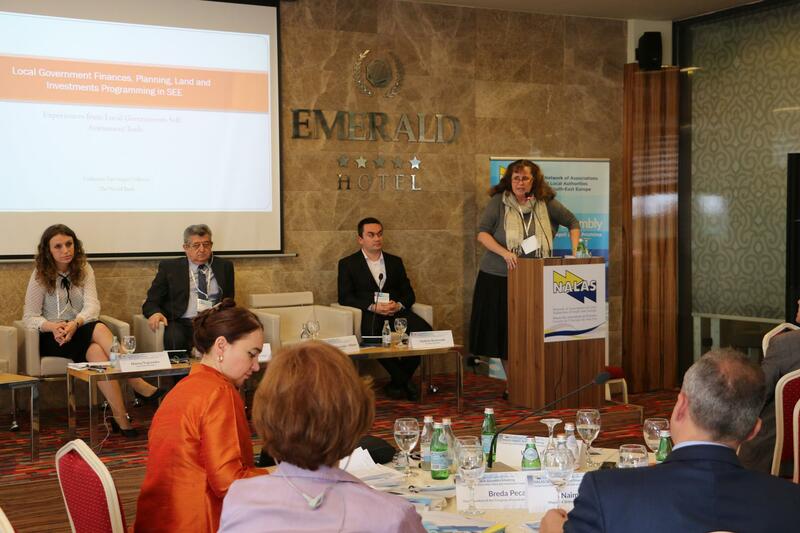 Also, they should not forget EU funding opportunities and cross-border projects", said Ms. Pinjo Talevska. The day concluded with launching of the book "Municipal Finances - A Handbook for Local Governments", published by the World Bank. 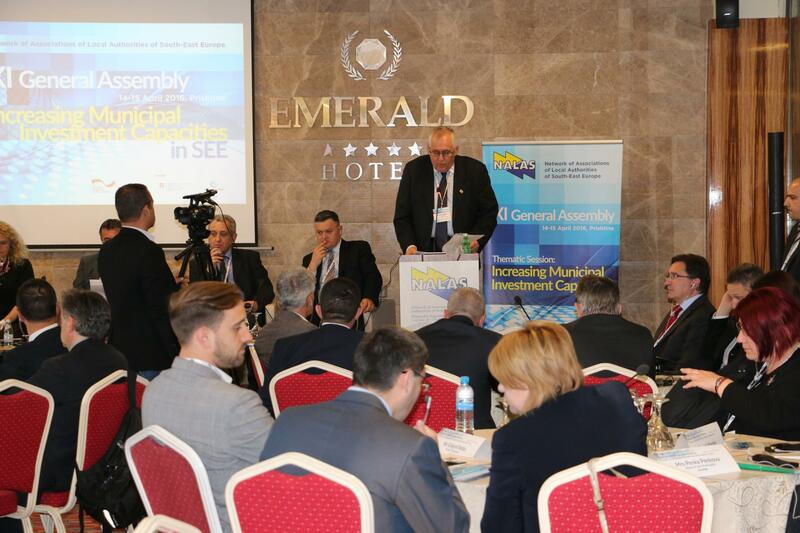 On 15 April, the statutory part of the NALAS General Assembly was opened by the current NALAS President, Mr. Emil Draghici, Ms. Breda Pecan, Vice-President of the Congress of Local and Regional Authorities and Mr. Shpend Ahmeti, the Mayor of Prishtina. 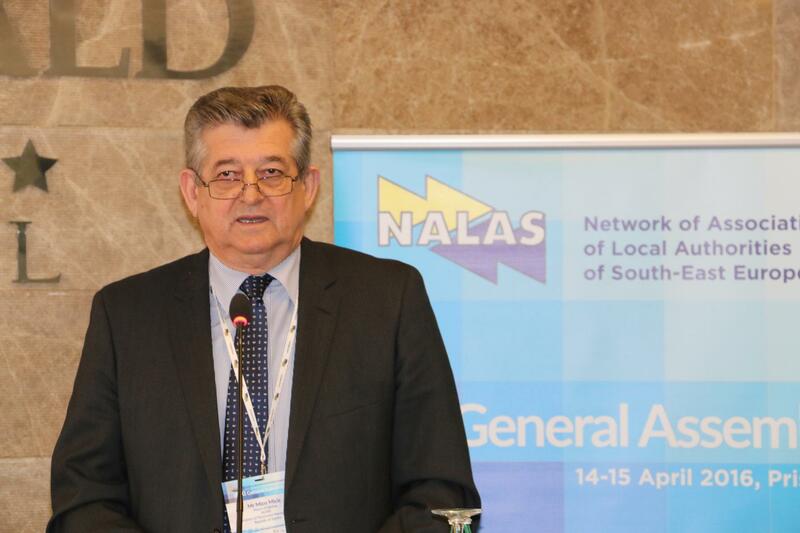 "In these 15 years, NALAS has proved to be a relevant representative of local governments of this region, and also a valuable partner for the Congress of Local and Regional Authorities. NALAS has proved that it is able to open important issues for local governments, discuss them, and exchange experiences, but also find viable solutions", said Ms. Breda Pecan, Vice-President of the Congress of Local and Regional Authorities. "It is important to work together and turn out borders from problems to opportunities. We at the Congress pay special attention to cross-border cooperation, where our local governments join resources and avoid duplication of efforts, especially in infrastructure project, health care, solid waste management, water supply, etc. ", said Ms. Pecan. "Speaking about my role as a Mayor of the Capital City, I use the quote of the former President of the USA, Lyndon Johnson. 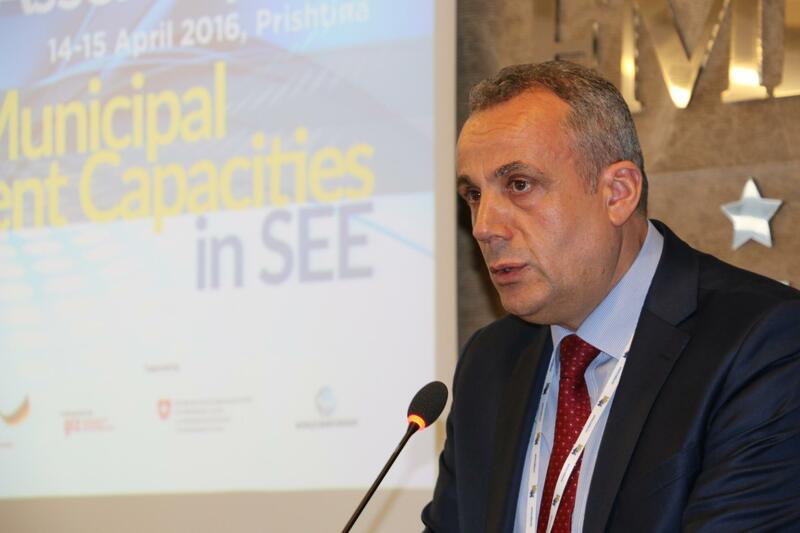 He said: When I think that being a President is difficult, I just think thanks God that I'm not a Mayor", said Mr. Shpend Ahmeti, the Mayor of Prishtina. "The future of government lies with local governments. Central governments are more conservative, whilst local governments take more and more responsibilities, responding to citizens' contemporary needs." Based on the rotation presidency system, Mr. Naim Ismajli, Mayor of Shtime Municipality, was appointed a new NALAS President, who will lead the Network in the next year. "In the next year of presiding with NALAS, I would work for maximum exchange among NALAS members, identifying key local governments challenges and addressing them via NALAS work. In doing so, we have to answer an important question: Why did we come together at NALAS? It is our common interests, and goals to be achieved by exchange of experiences and overcome local government challenges together. We come from diverse countries and municipalities, but we share the same problems and we are much stronger in addressing them together", said Mayor Ismajli in his inauguration speech. 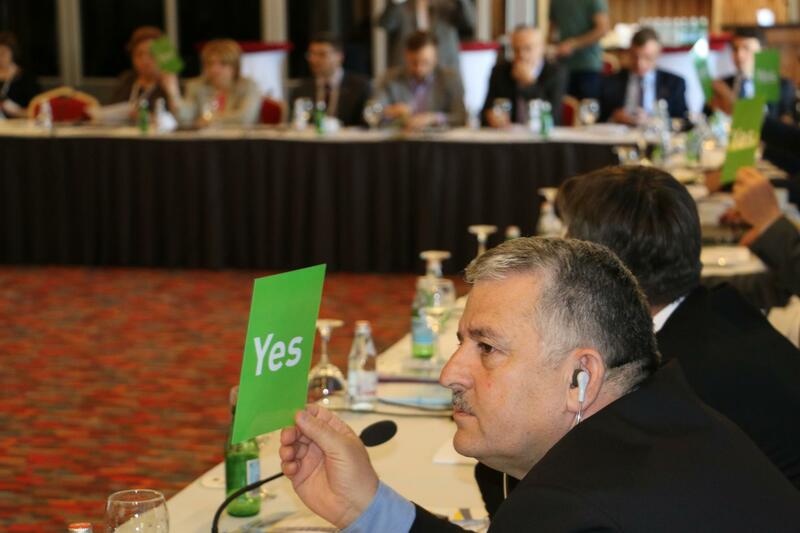 Delegates reviewed NALAS work in 2015 and the work plan for 2016, and discussed policy issues related to the refugee and migration crisis; mainstreaming gender at local level; and solid waste management in rural and coastal areas. The General Assembly adopted specific NALAS Policy Positions to Promote Gender Equality at Local Level and Policy Recommendations related to Solid Waste Management in Rural and Costal Areas. 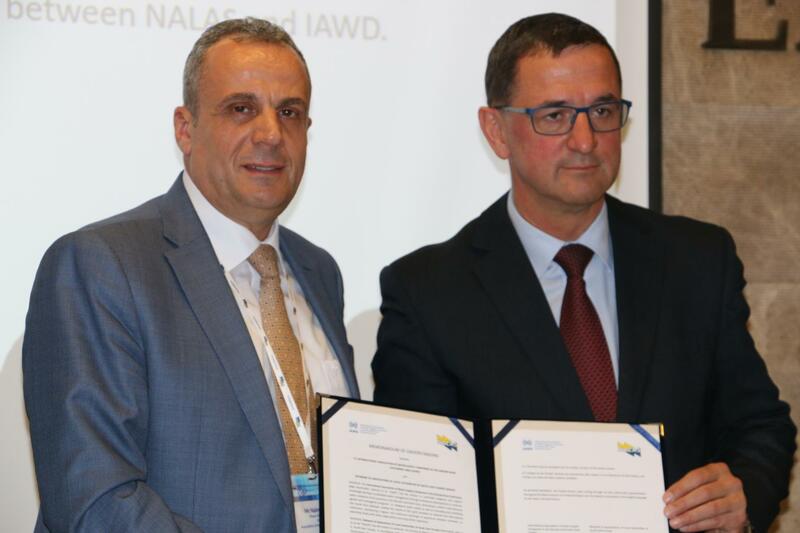 During the XI NALAS General Assembly a Memorandum of Understanding (MoU) was signed between NALAS and IAWD, the International Association of Water Supply Companies in the Danube River Catchment Area. "I am happy that I was able to attend NALAS conference yesterday and learn about the challenges of local governments in the Region when it comes to investments. We are here to join actions, develop capacities and improve services to citizens", said Mr. Walter Kling on behalf of IAWD.